Please RSVP as soon as possible, so we can plan for food, either by clicking on the button below or signing up in the hallway. A suggested donation of $10 per adult and $5 per child will be collected at the door to defray the cost of food and drink. Families are welcome and nursery care will be provided! If you want to donate to the farewell purse for Fr. 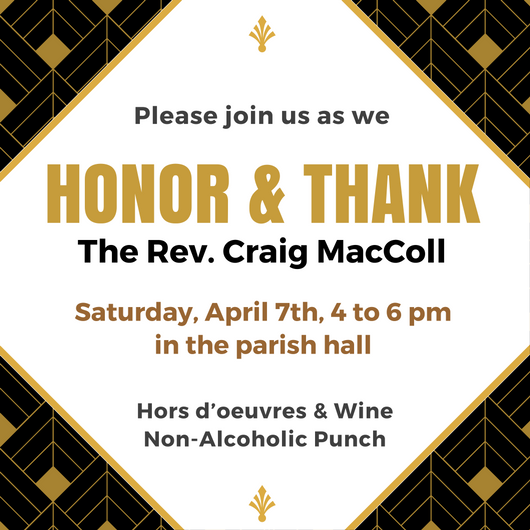 Craig, please use the envelope you received, with cash or check (made payable to Fr. Craig) and place it in the offering on Sunday or mail it to the parish office.